Mishka Fadgen is new to the Stone Ridge wolf pack, and after losing a challenge to earn the beta position, he’s offered a slot as an enforcer instead. His first task comes soon, as the alpha’s daughter, Sara, goes missing from college. Mishka accompanies several others to San Francisco, following a lead to her whereabouts. While his alpha is busy consulting with a detective who’s aware of shifters, Mishka hits the streets and starts searching. What he finds, however, isn’t what he expected—his mate. Mishka discovers a young, crippled human living in an abandoned warehouse. 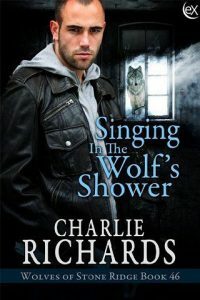 With a lot of coaxing—and the promise of a good meal and a hot shower—Mishka convinces Aramis to join him at the home the shifters have rented. When the detective shows up, an untrusting Aramis disappears. Learning that Aramis may be able to help discover Sara’s whereabouts only heightens his need to find the man once more. If Mishka manages to track Aramis down again, can he convince his mate that his intentions are sincere and not just a means to an end?